CareOffice from Carefile® Medical Systems is an integrated package of our CareBiller and CareBook modules. It provides a complete electronic billing system fully integrated with a very easy to use and full-featured appointment scheduling system. Full patient and doctor databases are also included. The Québec version fully supports Régie requirements including the new 'Rémunération Mixte' forms. CareOffice is also available in a version specifically tailored for the New Brunswick market and fully supports the Medicare Billing Plan including teletransmission and auto-reconciliation. Click on the CareOffice screenshot image to the right for a full feature description as well as several screen shots. CareOffice is a Windows application and runs under any 32-bit or 64-bit variant of the following Windows versions: Windows Vista, Windows 7, Windows 8, and Windows 10. 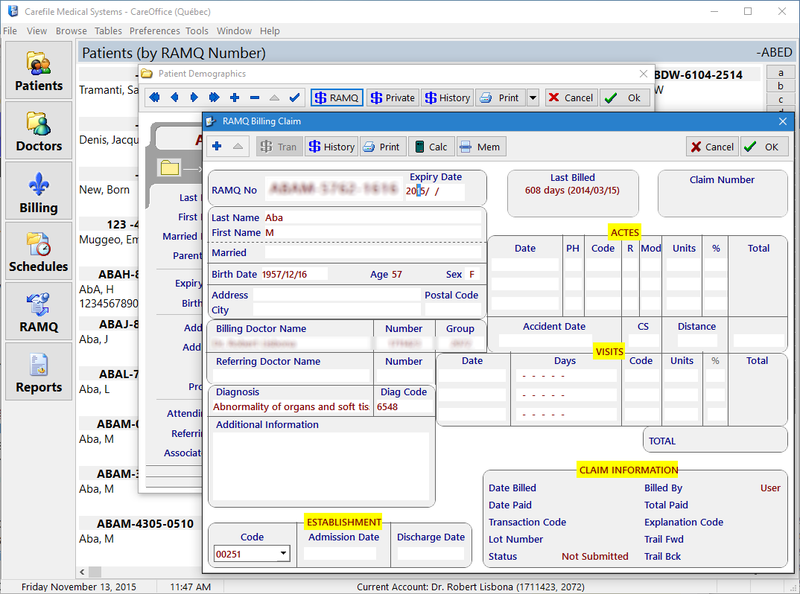 The billing and scheduling functionality of CareOffice are also available as seperate modules: CareBiller Windows and CareBook Windows. In Québec, we also offer Lite versions of both CareOffice and CareBiller at a discount for those clients who do not require the complexity of multiple account billing. Just added! The ability to add reminders to your appointments. You can now attach an audible reminder to each appointment. CareOffice© now offers an exciting new feature. You have the ability to Sync CareOffice data with almost any mobile phone. Send your daily or weekly schedule to your mobile phone's calendar application and never miss another appointment. Copyright © 1998-2017 Carefile Medical Systems Inc. All Rights Reserved.